After my last excursion to Costco, when I came home with LOTS of fruit (eight mangoes and a dozen Bartlett pears), which were all absolutely scrumptious, I got to thinking about buying fruit in the supermarket: how do you choose? (Even friends that I shared this abundance of fruit with commented on how good those pears and the mangoes were–that meant that every one of the pears and mangoes was good! If you’ve ever been tempted by those luscious looking fruit displays in the market, succumbed, and then gotten that fruit home, let it “ripen”, and found out that it has all the flavor of sawdust or cardboard, you’re probably more inclined to pass it by and get something like an apple that you think is safe. Been there, done that, passed on the T-shirt, but decided that I needed to know more about how fruits develop and ripen. Looks alone aren’t really the basis on which to buy your fruit. This quest started while shopping at Costco. While I have always been pleased with fruit (including berries) bought there, I wasn’t specifically there for fruit–I was there for cat food and laundry detergent. As I walked past the produce (not in the cool room) I was distracted by the lovely smell of pears. The case contained a dozen lovely Bartlett pears–rosy cheeks, plump, and unblemished, nestled in their individual slots in the case. 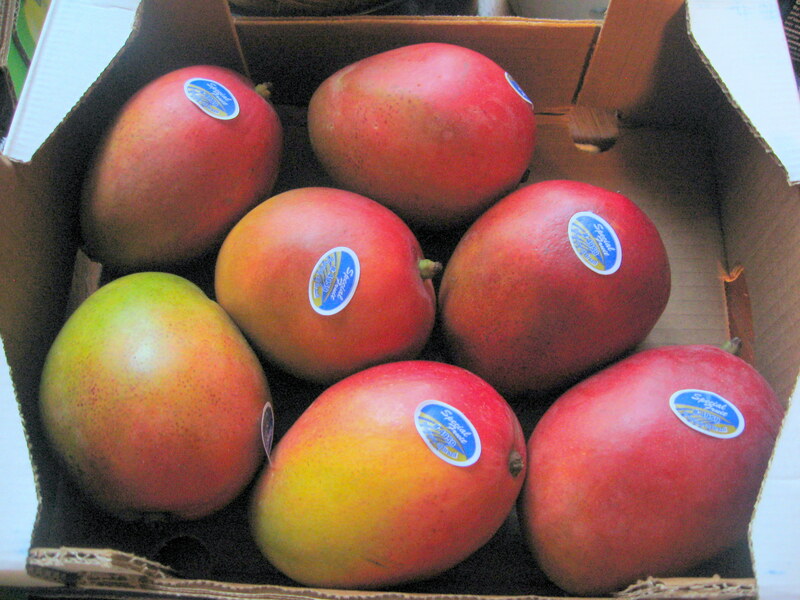 Well, I popped those into the cart, and then encountered the mangoes–not as aromatic as the pears, but lovely. (Both were much less expensive than in the supermarket–so much so that I could eat my fill and share some too.) With lots of fruit in my cart, I was further lured (but resisted) by the fragrance of peaches! Mostly I don’t think that you usually smell peaches–they are not usually that ripe. I had a long debate about pears or peaches, or mangoes, or not. I left the peaches because I’ve so often gotten peaches or nectarines (even from the farmers’ market) that may smell good if you pick them up and sniff, but which have never made to luscious…they’ve stayed mealy. So–here is the result of my exploration to see what I could learn any predictable way to ensure ripe, yummy fruit in my shopping bag. First, a definition of fruit: the female tissue (ovary) of the flower–mostly the thickened wall of the ovary which will have three layers. The peel (outermost), a thin membrane surrounding the central seed or mass of seeds, and that luscious, flavorful between those two thin layers. To get this sweet, desirable flesh, fruits go through several stages–usually fertilization (by the male pollen), proliferation of the cells in the ovary wall, expansion of storage cells where sugar is stored, and maturation of the seeds and preparation for eating (ripening)! Ripening is really leading to changes meant to attract beasties (animals, birds, and even people) to eat the fruit so that the seeds (now mature) can be carried away from the plant, and spread to other locations. In order to be ready (and desirable) to eat, softening of the flesh, and sweetening needs to occur. Unripe fruits are not desirable chow for man nor beast–there are defensive compounds, the meat/flesh is hard and not sweet and juicy–things that keep the fruit on the plant until appropriately mature and desirable as a food source. Climacteric: This is the form of ripening, triggered by ethylene gas (the paper bag trick? ), which stimulates the fruit to begin to use oxygen and to produce carbon dioxide (respiration) at a much greater rate than pre-ripening. When this happens the flavor and texture of the fruit changes rapidly, and then declines equally rapidly. Stored starch is converted into sugar–the yum factor here. Nonclimacteric: These are fruits that don’t store starch so there’s nothing to convert to sugar for ripening–they cannot improve after harvesting–they need to ripen “on the vine” (or the tree, or whatever) so that they can continue to produce sugars. They need to be mature enough that the changes that result in sweetening and softening have started. You cannot “artifically” trigger this process away from the plant. This means that these must be picked and shipped as close to ripe as possible–which means that they are more likely to be bruised in handling. Obviously, the distinction between climacteric and nonclimacteric is not black and white–it seems to me that there is a lot of grey here! The reason I’m telling you this? Well, knowing the ripening style is key to knowing how the fruit is going to respond once you’ve paid for it, toted in home in your grocery sack, and parked in on the kitchen counter, in the fruit bowl (or maybe the fridge). You’re going to have to do a little memorization here to get an idea of which fruits are which and learn some general categories of fruits, other than apples and oranges. Ripening in fruit involves changes in the respiration (yep, oxygen and carbon dioxide use and production). Climacteric ripeners are fruits like bananas, avocados, pears, and tomatoes (yes, tomatoes are a fruit even though we treat them as a vegetable) to give you a few with which you’re likely already familiar. They can be harvested hard (or firm) and green (but mature), and the ripening process initiated “artificially” in controlled environments. They will will continue to improve in flavor and texture, softening and sweetening. Nonclimacteric ripening fruits (include pineapples, citrus fruits, most berries, and some melons) will not ripen if picked hard and green–the ripening respiratory changes need to be initiated while on the plant, though it can continue after harvest to some degree. Now to consider some of the fruits that we find in the market. Pome fruits (Apples, pears): These pome fruits are climacteric–the conversion of stored starch to sugar can be initiated after harvesting. Apples are generally sold ripe and should be immediately wrapped and refrigerated–otherwise the “death” process continues and they will not be good to eat. The ripening process has been started after harvesting mature, but still unripe, and later exposing them to ethylene in controlled conditions. 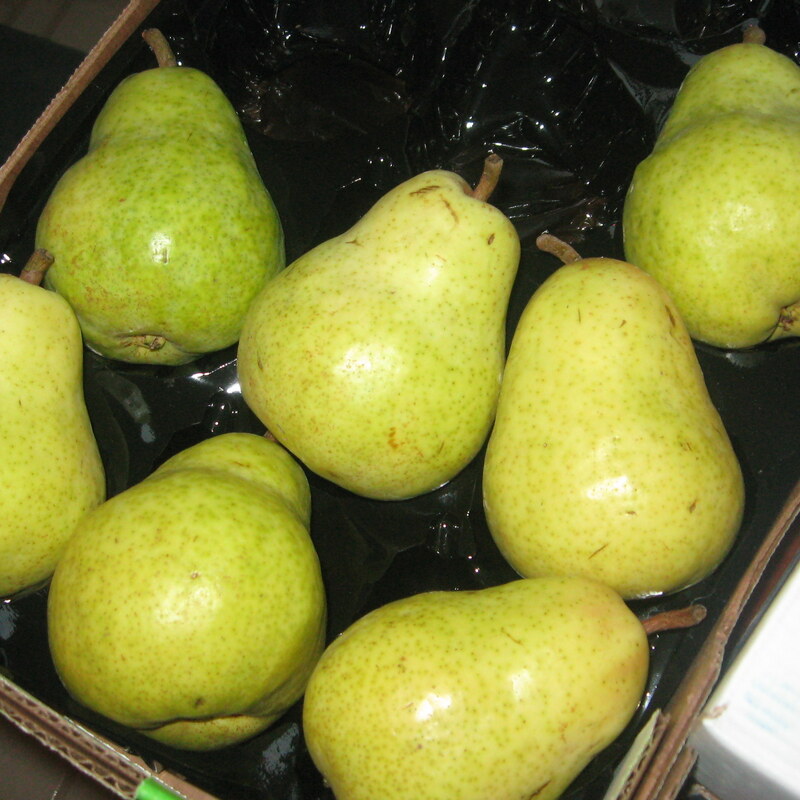 Pears are generally sold unripe; they should be ripened at relatively cool room temperatures, then refrigerated, without close wrapping. They have a higher rate of using oxygen and producing carbon dioxide than apples, so they will not store as well as apples. Quinces (related to apples and pears) are not eaten out of hand–they must be cooked–even when ripe, but they have a wonderful floral aroma and flavor. (But an extra one to just leave lying on the counter to perfume the room.) When cooked they turn a translucent deep pink to red. If you can find them in the fall it’s worth the effort to find some recipes and cook some. Stone fruits (Peaches, plums, cherries, apricots for example): These fruits (relatives of the pome fruits) are named “stone” fruits because of the large, hard seed that surrounds the seed in the center. Apricots can be found in the market–but are often a waste of money–since they are really delicate, and all to often lack any real flavor and aroma. They do some ripening after harvest, but must be that lovely yellow-orange color, signifying that they are appropriately mature. They need to be ripened at room temperature; recommendations seem to be to refrigerate them unripe and then ripen as needed. Cherries, also stone fruits, can be either sweet or tart (outright sour if you will)–which is a tip-off that they differ in–you guessed it–sugar content. They do not improve after harvest, so that means that they are picked ripe, and fragile, and are going to be expensive because of the special handling that they need. Peaches and nectarines (yellow or white, with a large seed) begin ripening on the tree and “are said to continue their flavor development even after harvest” (McGee, location 9749 of 27510, Kindle, third generation). The “said to” suggests buyer beware to me. When I see statements like the ripening of peaches is controlled by “endogeneous and exogeneous factors” I begin to think that this somewhere between! Being tasteless is only one of the problems facing the purchase of peaches–if they’ve been in cold storage (perishable, remember?) the flesh can be mealy and they will not soften to the lush, juicy fruit we want, even if they smell good. This has something to do with the pectin in the flesh; they should not be stored below about 45° F.
Plums (climacteric ripeners) will ripen after harvest–and can be stored cold and then allowed to ripen slowly at about 55° F.
Melons: Melons are related to cucumbers, but unlike the cucumber, are not good when “unripe”. The melons that we are best acquainted with can be classified as “summer” or “winter” melons, depending on the kind of rind that they have. While we can say that some are climacteric and some nonclimacteric, they do not store starch so they need to ripen on the vine. Summer melons are the very aromatic, fragrant, sweet ones that need to ripen on the vine–that’s to say that they are climacteric -they don’t improve after harvest. They will separate from the stem when ripe. Summer melons would generally include Charentais/Cavaillon; muskmelons (cantaloupe is a misnomer), Galia (also known as Ha Ogen) to give you some of the more commonly available ones. Winter melons are more like cucumbers and squashes–less sweet and aromatic than summer melons–and generally nonclimacteric. Examples of these wold be honeydew melons, Casaba, Santa Claus, Canary melons. Citrus fruits do not ripen after picking. Figs are sort of climacteric–they will ripen some after harvest, but they must be harvested at an appropriate degree of maturity–I think that this means that the ripening process must have been initiated, or very close, on the tree. As a last attempt to make some generalizations about fruit types, I wondered if the starch content of the mature, but unripe, fruit would give some cohesion to how to select fruits. What I found was not much information at all on starch content of mature but not ripe fruits. There were studies of the changes in starch content of fruits at various stages of growth and maturation, but nothing that allows any easy to follow rules for predicting how a fruit ripens. This all started off seemingly nice and categorized, but–we are dealing with living tissues that don’t fit nicely into categories. Other confounding issues are simple semantics–when articles say “maturity” are we talking physiological maturity or “commercial” maturity? So it’s been interesting researching this–but have I come up with any hard and fast answers? Well…maybe? Knowing the predominant ripening style of a fruit will help you in handling the fruit to get the most bang for your buck–the best taste and texture. We cannot really make any general statements about specific categories of fruits–except possibly berries. Climacteric or not, immature fruit will not ever ripen to that lush, sweet treat that we’re hoping for. I would add a caveat about getting good fruit–no matter which style of ripening, the best fruits will be those that have spent more time ripening while attached to the plant! Use all your senses in fruit selection: if it does not smell good, it very likely will not taste good. When you’re testing for softness or give of the flesh–do it carefully. Testing for softness doesn’t mean to poke a finger or thumb into that piece of produce–even fairly firm produce can bruise if squeezed hard enough. Learn the visual appearance of ripe fruits–color and shape. Look for heavy fruit for its size–this is an indication of maturity at least, and maybe juiciness (e.g. in citrus). Food and Agriculture Organization of the United Nations Document for Production and Sale of Fruits and Vegetables. Choosing ripe fruit, Fine Cooking. Includes a chart of which fruits ripen after harvest.